Belize, A Gem of A Country! Belize is a small country of approximately 8,867 miles (22,963 square kilometers) located on the east coast of Central America. It is surrounded by Mexico, Guatemala, and the Caribbean Sea. 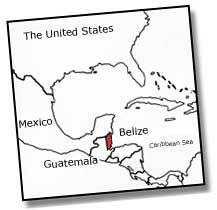 Until 1973, Belize was part of the British Empire and was known as British Honduras. It only became an independent country on September 21, 1981. Today the population of Belize is close to 245,000. The geography of Belize varies greatly from the north to the south. In the northern parts the land is very wet and swampy. Yet the south of Belize contains many dry mountains and savannah plains. At its highest elevations, Belize rises to 3000 feet above sea level. Belize is a country of jungle-clad mountains, rivers, forests, savannah plains, swamp lands, lagoons, off shore cayes, and a barrier reef-the largest in the northern hemisphere (185 miles long)! Only the Great Barrier Reef off the coast of Australia is larger. The climate in Belize is subtropical, meaning that the summer highs are rarely above 95 degrees Ferenheight and the winter is usually not lower than 60 degrees Ferenheight. The rainy season of Belize is from June to November and is known as the hurricane season. Hurricanes have had a powerful impact on Belize's history and culturethey are literally a way of life for Belizeans. February to May is the dry season and December to January is known as the transitional seasonno hurricanes, but unpredictable rainfall. Annual rainfall varies from 180 inches in the south to 60 inches in the north. Almost always though, there is a sea breeze blowing in from the Caribbean Sea. Belize used to be known as a great timber exporter (they exported logwood and mahogany). Today, the biggest export is sugar and accounts for almost half of Belize's exports. Other major imports include wood, bananas, oranges, and lobster. The largest employer for the country is the banana industry. However, the banana industry was severely impacted by Hurricane Iris in 2000. The tourism industry, is Belize's newest and fastest growing industry. Belize is one of the regional leaders in environmental protection. With planning they have been able to preserve much of the natural beauty of the country. The people of Belize demonstrate a pride about their unique natural resources and work to preserve them. A significant portion of Belize has been set aside for national parks, sanctuaries and reserves in order to protect the diverse plants and animals found there. Unlike many other neighboring countries, almost 60 percent of the country remains covered with biologically diverse forests. Because of this, many of the country's animal populations live in relatively healthy populations. One of the reasons tourists visit Belize is because of its natural beauty and protected wildlife.